The desperate, round-the-clock search for the team has been beset by torrential downpours. RESCUE DIVERS REACHED several kilometres inside a flooded cave where 12 boys and their football coach have been trapped for a week, offering a flicker of hope for the harrowing search. The desperate, round-the-c\lock search for the team has been beset by torrential downpours that submerged tunnels near the entrance, blocking divers from going in. 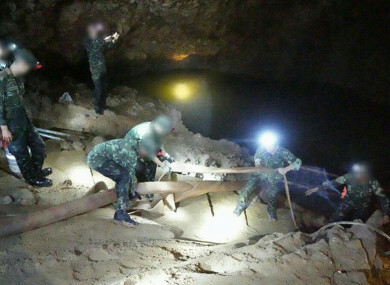 But Navy SEAL divers reached a T-junction in the depths of the cave just two or three kilometres from where the boys are believed to be, Chiang Rai governor Narongsak Osottanakorn said. But even without food he said young, athletic boys could “easily live for a month or a month and a half” with the main challenge their mental resolve. “The biggest issue that they are facing right now if they are alive is psychological because they don’t know at what point they might get rescued,” Mirza said by phone from the US state of Indiana. Email “Divers come within three kilometres of where missing football team is thought to be trapped”. Feedback on “Divers come within three kilometres of where missing football team is thought to be trapped”.